Anton Woldek and I have recently Launched the Game Audio Podcast. The general premise of the Game Audio Podcast is to provide an entertaining perspective into our little corner of the world, and shed some light on the challenges we're all facing through discussion topics, industry related news, the game audio showroom, gear news, and special guests. The idea came from discussions that get started at conventions, in sessions, on forums, and in chat rooms throughout the year. Often we would find ourselves talking with peers about general concepts, techniques, creative solutions to limitations...and we found that, for us, it wasn't enough to just touch base once and awhile and throw around our experiences and opinions. Our goal is to extend some of those conversations and share the idea’s and thoughts that come from mixing up a diverse group of professionals and engage them in a topical discussion. Hopefully we will succeed in bringing together some good conversations! Tune in, and let us know what you think! 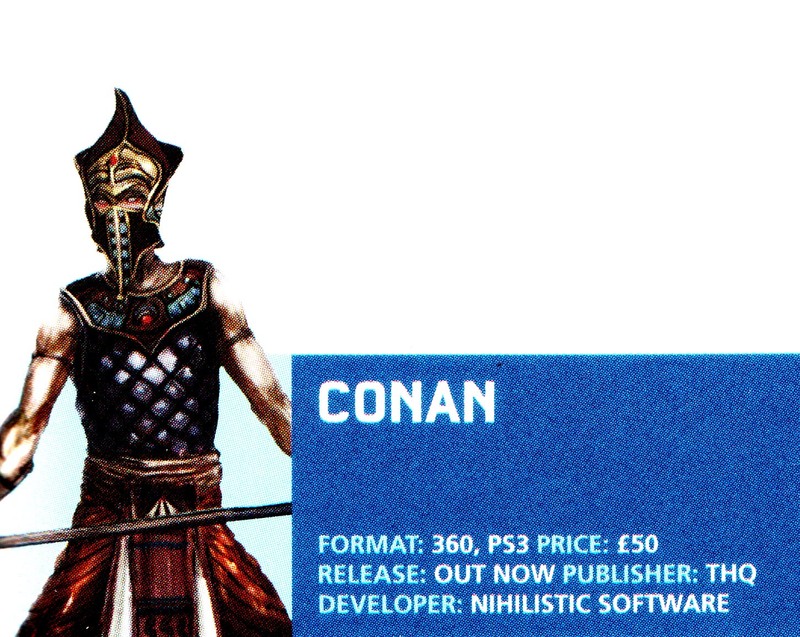 We did something interesting with the impacts and deflection for the 9 weapons and 8 melee types used in the X360/PS3 title Conan for Nihilistic Software. I'm attempting an overview of the melee specific weapon system we implemented using FMOD Designer and other Nihilistic proprietary in-house tools. 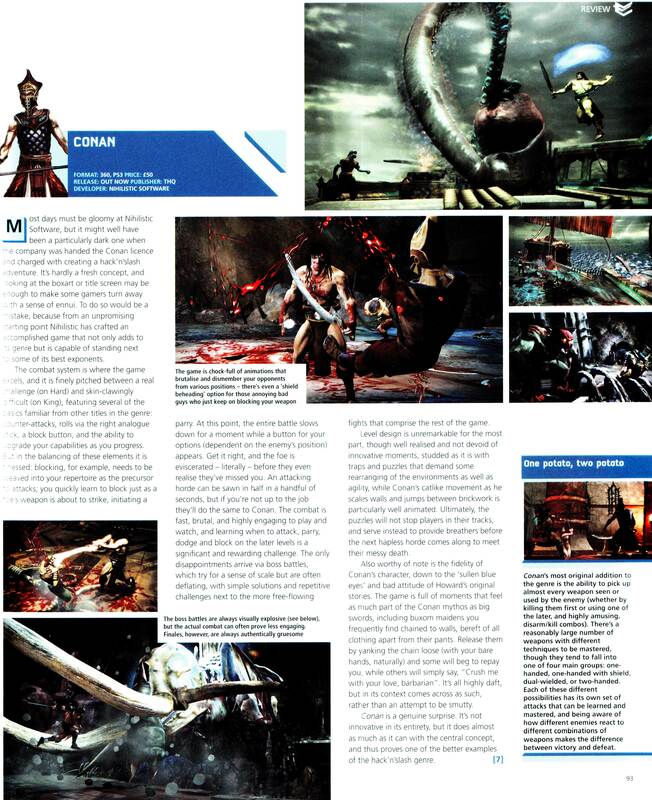 Throughout the process, the overarching goal was to add diversity and brutality to what is the main focus of the game. The use of content level variation, pitch and volume randomization, and elemental layering allowed us tomake the sounds of combat non-repetitive over the course of the game. In a game so heavily focused on combat where you spend each level mowing down enemies from start to finish, we knew that we had to make a combat system that reflected the core gameplay objective of giving the player diversity while making the sound varied enough to prevent fatigue. Hit's are defined as actions that impact an NPC and cause damage, and we were tracking both Light and Heavy hits. We used a game parameter for surface type that was passed from the games collision detection to FMOD in order to track what surface was being impacted. The FMOD Event that was triggered was based on the weapon type being used by either the player or NPC and whether the hit was Heavy or Light or Deflected, it then received it's material type parameter and jumped to it's correct position within the FMOD event where it then layered the impact sound depending on weapon and material type. For non-damage causing hit's usually specifically involving weapon interaction with the environment, we used a different Event for deflections. These were combined at runtime each time the sword deflected off a material in the environment. Additional limiting of the number of voices for the deflect event helped to prevent "stuttering" as the weapons blade tracked through an object. FMOD's Event limiting system is well equipped to handle this aspect of implementation by providing mulitple max playbacks, and max playback behaviors. The system we built for Conan built to the strength of the IP and the genre. Conan - Melee Combat Sound from d k on Vimeo. Another game that successfully used the layered Weapons approach was Fable2 by Lionhead. (Microsoft game Studio's) In a talk given by Kristofer Mellroth at GDC 2009 titled: The Audio of FABLE 2: Large Scale Collaboration for Next Gen Games, the weapon system for Fable2 was outlined to illustrate the decisions that were made regarding content, and implementation. The basic building blocks of melee and ranged weapon combat were abstracted at the content level and recombined at runtime using a constantly shifting set of source material controlled by gameplay variables. 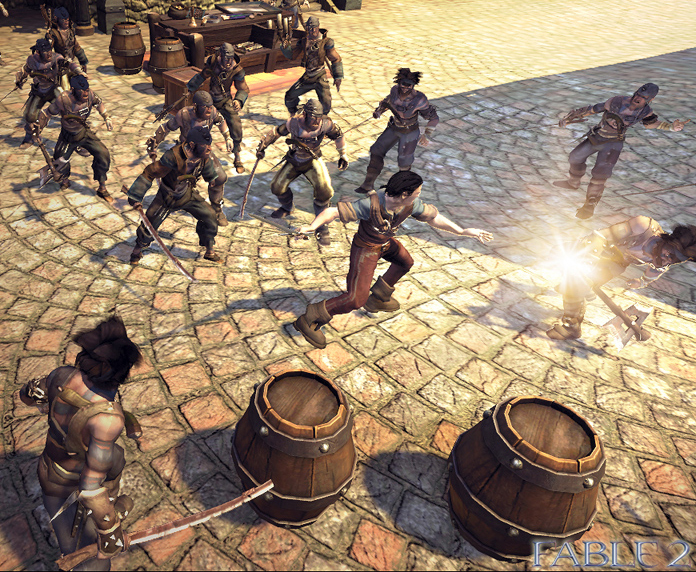 In Fable 2 there were 7 types of melee weapons with 5 levels of sound interaction: Swipe, Strike, Scrape, Ring, Block, and Flourish. Swipe – the sound of the melee weapon swinging through the air. Strike – the muted hit of the weapon striking any object. Scrape – the sound of the weapon scraping as it passes through an object. Ring – the pleasant ring of a weapon that has struck cleanly. Block – a dissonant clang of the weapon as it collides with another weapon. Flourish – a special longer, sweetened version of the weapon swipe to convey the sense of a move with greater power. Sound for these different actions were combined and randomized according to type with weighting and some with the potential to not play when triggered. For instance when the Player connected a hit on an NPC the game would play a Swipe, followed by a combination of Strike, Scrape, Ring in order to arrive at a coherent impact. By breaking out the separate elements of each melee type and allowing for content and parameter variation the diversity of swings and impacts are increased. As we continue to move forward with larger worlds that demand less repetition of often repeatable actions, the elemental approach to combat continues to be our greatest asset in driving toward less fatiguing audio. Finally gotten round to pulling together a set of gameplay and audio implementation related video's for the Conan project I was involved with some time ago. Some of the tricks were outlined awhile back through this thread over at Game Audio Forum. Most of these techniques have become commonplace in the current generation of game including things like: distance based LPF, game parameters tied to DSP, layered melee combat systems, and state based interactive music. It's always good to be able to look back on a project after some time has passed and fondly remember the good times. Hope you find something of interest!